Artistic gymnastics is incomplete without asymmetric or uneven gymnastic bars. Regardless of the fact that you are an experienced or a budding gymnast, you will require these bars. Gymnastics bars available for sale can be easily bought online. A single bar also works but mostly you will require at least two bars for good gymnastics practice. With two bars multiple routines can be tried and practiced. It was realized gradually that transitioning between parallel bars of same height was difficult, a new way was discovered. Two horizontal bars set at different heights are perfect. Evidently it is important that the bars you buy for yourself should have the feature of height adjustment. This enables you to set the bar height according to your bar routine. There would be many specifications that you need to pay attention to, as a buyer. Foremost thing in your mind should be quality. Never invest in a low quality product, you might regret it later. When you buy bars for your kid, their safety should always be the first thing on your mind. 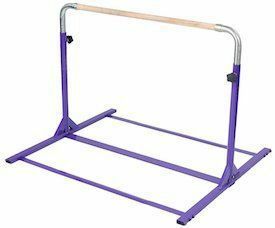 4 Cheap gymnastics bars for sale? What should you look for? Various gymnastics products and accessories are now available at retail and online stores. You do not need to get baffled with the wide range of options. To reduce your confusion we have prepared this article. Top 5 rated bars that have been used and reviewed by various experts and beginners are listed here. This will help you narrow down your options. Every gymnastic bar included in this list is top quality. My favorite is the Gymnastics Junior Kip Bar by Tumbl Trak. I recommend this bar because of its high weight handling capacity. When you buy a practice bar for your kid, you know they will outgrow it soon. This way the bar you bought becomes useless after a year or so. But, that is not the case with this product. The horizontal bar height can be between 3.16 feet and 4.66 feet. It is a widely loved high quality product that is priced well. Perfect at-home practice and training bar by Tumbl Trak that is perfect for an aspiring gymnast. The bar has decent price so price conscious buyers can depend on it. Its high quality structure is sturdy and durable enough to assist in gymnastics training at home. The 1-1/2 inches competition level bar of this equipment is made of beech wood. You will have 7 different height settings ranging from 38 inches to 56 inches. There are D-2 knobs that can be pulled to adjust the bar height easily. Junior Kip Bar by Tumbl Trak is available in two beautiful colors, purple and red. It will definitely bring a smile on the face of your kid. One greatly appreciated feature of this bar is that it can be used very easily. The gauge steel heavy tubes keep the equipment steady and ensure the safety of your little ones. It has round corners that are an additional benefit that will keep the gymnast safe. There are not any other Kip bars in the market yet that offer such feature. This cheap gymnastic bar could use a bigger limit when it comes to height adjustment. It might wobble but that is extremely rare. Overall a good product to invest in. The need to have complete faith in their bar is crucial for a budding gymnast. The Purple Junior Adjustable Horizontal Bar is something you can trust as a parent. Your child will be safe practicing on this equipment. It has height adjustment feature from 3 to 5 feet. The different bar height settings are 60, 54, 48, 42, and 36 inches. The product will take 4 feet width and 5 feet in space in length. The dimensions of its base mean that you can use a 4 X 8 gymnastic landing mat with it. Design of this equipment includes adjustable lock bolts and rubber base caps. It has wooden bar that is 1-1/2 inches. This bar is extremely strong and its capacity is more than 100 lbs. The price is great, affordable and perfect for a durable product like this. It could be a little rickety or wobble a bit depending on the height and surface. But, this problem can be solved by using sandbags. The manufacturer Nimble Sports gives a 1 year warranty on everything sold. Although, there is a return policy of 30 days but it comes with restocking fee of 20% on all items returned. Adjustable Horizontal Bars by Joom Beam have a range from 3 feet to 5 feet height adjustments. 5 different settings are 60, 54, 48, 42, and 36 inches. It can be secured with lock down ultra stainless steel screw bolts. The frame is built for durability and it is corrosion resistant. It comes in a stunning black and pink powder glossy coating. The hardware is made of stainless steel and all frame ends have soft rubber caps. A 4 X 6 feet standard size should be fine as a landing mat for this bar. The horizontal bar by Joom Beam claims to handle up to 175 lbs of weight. But, buyers think that it cannot handle more than 100 lbs. It has a steady base but you can add protection just to be sure. You can fix the base to the surface or use sandbags. The beam is 1-1/2 polished premium wood. The precision manufacturers provide a 5 year warranty on this product. Adjustable Horizontal Gymnastics bars for sale by Joom Beam are perfect for beginners. Might not be that suitable for experienced gymnasts. Price would be perfect if bought on sale. The product is certainly durable and very dependable. One of the best expandable kip bars is this edition by Z-Athletic. It is a heavy-duty, free standing, stable, and portable equipment meant for indoor storage and use only. The fiber glass rail is 40 mm diameter and is covered with synthetic non-slip wood material. Height of this kip bar can be adjusted from 36 inches to 59 inches. The adjustable snap locks are used to change height settings. It can take 130 lbs of maximum weight. This gymnastic equipment is made to work through the practices of level 1 to 4. A 4 X 8 feet or 4 X 10 feet landing mat should be sufficient with this kip bar. 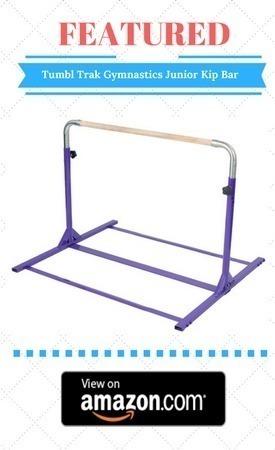 This is one of the best practice bars available from these reputed manufacturers of gymnastic equipment. The assembly could take a little more time than you anticipate. The product quality is good but some reports of internal rusting have been recorded. Although isolated, but you can protect your equipment by using it indoors only, as suggested by the company. The price is mid range which makes it a good buy. The manufacturers strictly mention the indoor only use. If use outdoors the life and quality of the product will be effected. 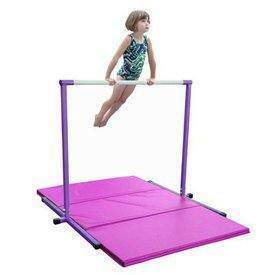 A 4 feet Horizontal Purple Bar by that is made in the USA by Nimble Sports. These gymnastic bars for sale are available on retail stores and online portals as well. The base of the equipment is 4 feet in width and the height is 4 feet high. Wooden bar is used which is 1-1/2 inch round and it can support up to 100 lbs of weight. The bar is not adjustable. But, you can yourself add options to adjust height later. The bar design includes lock bolts that can be adjusted and base caps made of rubber. One normal 4 X 8 landing gym mat is included with this product. It is folding mat with 3 sections of 2 X 4 feet each. This feature allows easy storage and transport. The manufacturers of both mat and bar are the same. Mat has a firm 1-3/8 inches thick foam within a vinyl coated 18 oz. nylon cover. This cover is puncture, mildew resistant, and fire retardant. Manufacturer Nimble Sports provides a 1 year guarantee on all products sold. Every returned item means 20% restocking cost and return policy is 30 days. The absence of adjustable height might be an issue for some but otherwise it is a great product. Cheap gymnastics bars for sale? What should you look for? Are you looking for cheap gymnastics bars for home? What are the features you should pay complete attention to? Are there different considerations for home gymnastic equipment? When buying gymnastic equipment for your home, you might have to think a little differently. The priorities could vary in both cases. I will provide a short guide for buying gymnastic bars. Dimensions- Before buying a gymnastics bar for your kid pay attention to its dimensions. What kind of space do you have at home? What is the height of your ceiling? Remember that buying and placing the equipment is not your only job. Your kid will need lots of empty space around and even above the equipment to practice flips and turns. Ensure you have empty space all around the bar. The height of ceiling should be your priority. While practicing, the arms and entire body of the gymnast is extended above the bar. Consider height of your kid and add the length of their arms to it. Material- What material is the bar made of, is it wood, steel, or something else? What are the bars made of? Is the equipment specifically meant for indoor use? The bar itself could be made of steel, wood or synthetic material. Consider your material of choice and then make decision accordingly. Also look for the material the frame is made of. The frame and bar should be strong enough to withstand the weight of your kid. Also, consider whether the equipment is meant to be used indoors or outdoors. Adjustable Height- Your kid is still growing, so buy a kip bar that has the provision of adjustable height. You can increase or decrease the bar height. It depends on the type of gymnastic routine and the height of gymnast. Price- You have to look at your pocket. Budget is a crucial aspect. How much money can you spent? Decide beforehand the maximum amount of money you want to invest. This way you will narrow down your options making the decision making process simpler. If you want to look at other slightly more expensive gymnastics bars options, read our detailed reviews here. There are a number of gymnastics bars for sale. In this article we have selected and listed the top most products for you. I hope this will be your buying guide and help you decide the product you want to buy. 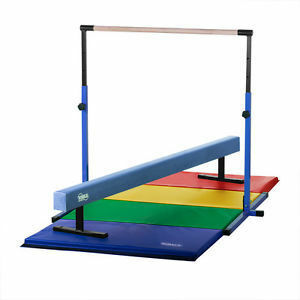 But I recommend the Gymnastics Junior Kip Bar by Tumbl Trak. It has height adjustment feature from 3.16 to 4.66 feet. It is a widely loved high quality product that is priced well. Various gymnastics products and accessories are now available at retail and online stores. Locating a good quality gymnastics bar of your choice is easy.